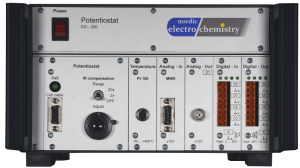 ECi-210 is a modular potentiostat / galvanostat for advanced electrochemical studies with a medium sized footprint. It is a upgraded version of the ECi-200 and is featuring logarithmic current sensing for 6 orders of magnitude. Multi-Working Electrode (MWE) Module – Measure the current from up to 8 electrodes simultaneously using either linear or logarithmic current sensing.